Iowa Car Accident Burn Injury Liability and Recovery | Hupy and Abraham, S.C.
Who will pay for my injuries if I suffer a burn in an Iowa car accident? 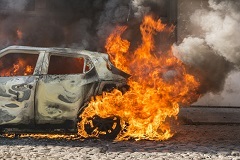 Liability in any car accident can be complicated, but a car fire that results in a burn may be especially complex. Both the cause of the crash and the cause of the car fire must be thoroughly investigated before you can seek fair compensation from the party, or parties, who caused you the significant pain of a burn injury. Another driver. The collision and resulting fire may not have occurred but for the negligence of the driver who hit you. The car manufacturer. The manufacturer didn’t cause the crash, but the manufacturer may have made a defective vehicle that could not safely withstand the impact without a fire occurring. The car mechanic. If a mechanic was negligent in fixing a vehicle and that caused a car fire, then the mechanic could be liable for the resulting burn injuries. One or more of these parties could be responsible for paying for your damages. If you bring a lawsuit against the wrong defendants, then those defendants will likely explain why they are not liable to the court and the lawsuit will be dismissed. You will not recover damages. For this reason, it is extremely important that your case be brought against the persons or companies that caused your burn injury. That way, you can recover the fair damages to which you are legally entitled. For more information about recovering from a burn injury or another type of car crash injury, please start a live chat with us today.